A thought-provoking book that delves into the age old question "Why Am I Here?" and comes up with a simple but satisfying answer, based on the author's lifelong research of psychology, quantum physics, metaphysics, astrology, philosophy, and The Bible. 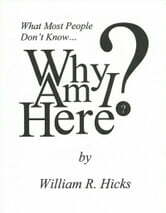 Books related to What Most People Don't Know...Why Am I Here? Faithbook: A Guide to Discover God. No Religions just Hard Facts.